Wayne Petersen, a great-nephew of Barney Oldfield's wife, is always on the lookout for auto racing memorabilia from the age of the pioneers. He tagged this short silent film (embedded below) from 1913 on early auto racing in Santa Monica, California for me. 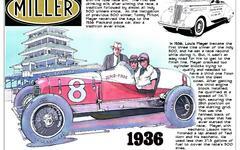 Two great drivers of the era are prominent in the film - Teddy Tetzlaff and Earl Cooper.